Wednesday was my birthday. My cousin came over and generously brought me, along with other things, a beautiful bouquet of flowers that included some vibrant-colored Gerber Daisies. Thank you, Karen! I woke up this morning and saw them on my dining room table with sun streaming in on them and they actually looked like they were dancing! I thought, "I have to do something to honor these beautiful flowers! I think I'll create a tablescape!" I decided I really wanted to showcase the colors of the bouquet, so I started with placemats from Pier One that reflected these colors. Then I opted to go with a different combination than I might have gone with in the past. I've been wanting to do a black and white table, and I figured this might be a good time, because black and white would not detract from the bouquet's colors, and might even enhance them! So I started with the black plates that were part of the Christmas box of plates from my stepdaughter. They are from Target and marked Home: "Zanzibar". I really like the pebble-like texture around the border! The next dish came from a Macy's sale and is a from the Martha Stewart Collection ( no pattern name indicated). I like the lacey lattice-work pattern on this plate. The top of my dish stack is a porcelain bread and butter plate from Mikasa that I purchased on-line. Its pattern is labeled as Urban Rose. I'm not sure how its pattern will photograph, but I love the gray accent on the floral design. Can you see how the gray color is just splashed across the rose like a watercolor? The table setting is completed with black stemware found while thrifting at a store supporting an animal shelter (I was happy to contribute to this worthwhile cause! 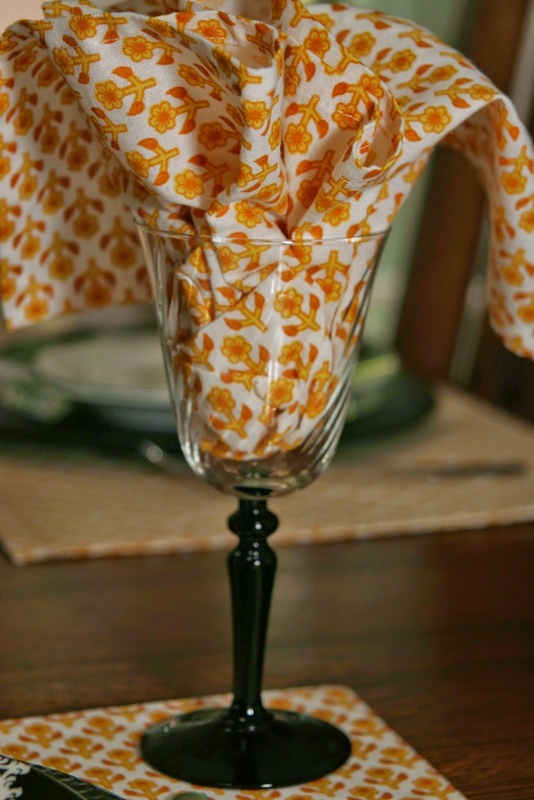 ); napkins that match my placemats; and, my Mikasa Regent Bead flatware. My centerpiece showcases my birthday bouquet. I placed it on a Dollar Tree black dinner plate and then for some added texture and interest, I added my Tabletop Lifestyles: Castleware plate from HomeGoods. Some ceramic birds from Michael's for accents and then some glass scatter beads complete the centerpiece and table. Do you think using the black and white plates makes the flowers stand out or should I have used more colorful plates? I do have some orange and yellow dinner plates, and some patterned ones in similar colors that would have complemented the bouquet. Christine's Link It Up! Table Party at www.rustic-refined.com. Thank you, ladies, for continuing to host these parties! It's always so much fun to see what other tablescapers have created! Your comments do make me smile, and I am curious about your opinions on this week's table! Thank you!! If you would like to follow my blog, please go to the top of the blog where it says, "Follow by Email", insert your email in the space provided, then hit "Submit"! Thanks!! Very dramatic and fun Rosie! Your black and white plates are so cool and different! The small flower pattern in brights is a great contrast and much fun with your birthday Gerbers! Happy belated birthday! O MY!! I so adore those black and white dishes!! Stunning and with the bright and pretty flowers...amazing!! Rosie, I visited here yesterday and left a comment. If you removed it whatever reason, that is ok. But if not I will just repeat it so you know I was here. The jist of it was - I love the drama of the black and white plates. 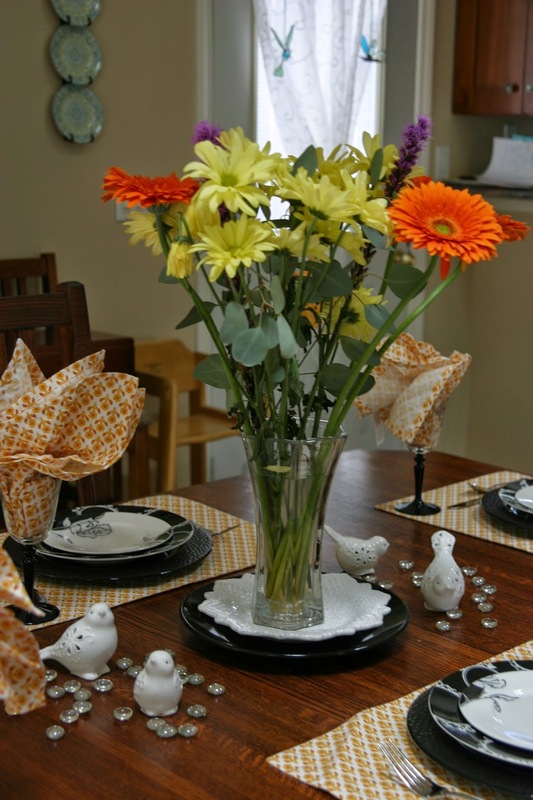 The placemats and napkins are a wonderful complement to the beautiful vibrant flowers in your centerpiece. I didn't say this yesterday but I do love those little birds! Hey, Rosie! Here's the deal...you could have gone 100 different ways with the dishes, etc. You chose the black & white for this go round, and it looks terrific! It would have looked great with colorful dishes, too. It's all about just putting it out there in whatever way you're feeling at the moment! You must have been feeling pretty doggone good, because this looks terrific! I love the placemats & coordinating napkins!!! I really love the plates with the pretty open frames on them, too! They remind me of something I've seen on a store display...very cool! I love the "watercolor" of the roses on the top plate, too. Very sophisticated! I hope you had a wonderful birthday and that you continue to celebrate all week. You deserve it! Happy Belated!!!!!!!! I'm with Alycia, your choice of black and white with those colorful flowers was brilliant! The stack is gorgeous and they really make your bouquet pop!! Beautiful table!! Forgot to wish you a HAPPY BIRTHDAY!!! A very pretty table and I adore the flowers. Black and white was a good choice! Wow, you really made some fun and unique choices here. I just love the little birds and "stones" surrounding your centerpiece and the white plate the floral is placed on is gorgeous! Happy Birthday!! 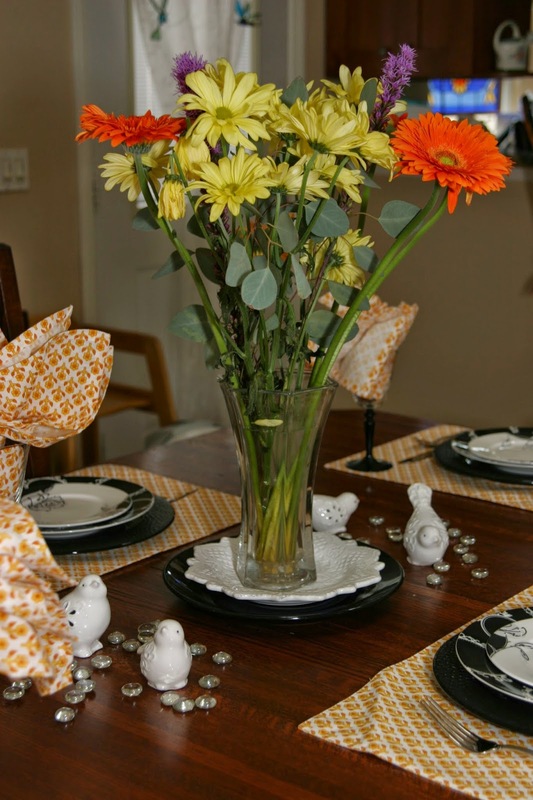 I think the black and white dishes (which I adore) are perfect, they allow the flowers to take center stage. The white textured plate is pretty cool, also. These are such happy flowers! I really like your placemats and napkins and those little birds put a huge smile on my face! What a delightful table! Happy Birthday...so nice of your cousin to bring you those beautiful flowers and you created a beautiful tablescape in their honor..Love those placemats...and beautiful plates too! I love this table....love the black and white and your birthday flowers are soooo pretty!